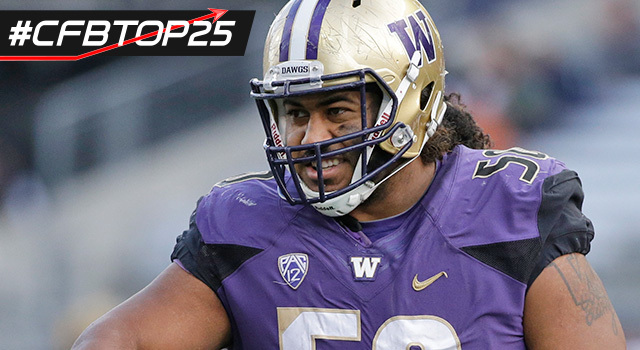 A massive force as the anchor of the Huskies' line, Vita Vea returns as one of the most heralded defenders in college football. At 6-foot-5 and 340 pounds (school measurements), Vea has the size and strength to dominate as a nose tackle, but it would be folly to assume he's just a big body who clogs up running lanes. Yes, Vea is more advanced as a run stuffer than pass rusher at this point in his career, but he has the athleticism and quickness to make plays in both facets of the game. It was a surprise when he elected to return for another season at Washington instead of entering the 2017 NFL Draft given that scouts hold him in such high regard. If he takes another step in his development in 2017, he could have NFL evaluators salivating over his potential. Vea received votes from four of seven CFB 24/7 experts, with a high of No. 7 in one analyst's rankings. In CFB 24/7's "17 for '17" series, Vea was rated No. 5 on the list of college football defenders most likely to become NFL stars. Where do fans rank Vea? We asked Twitter users who they considered the best player in college football. Vea didn't receive a vote. Players who do their work inside the trenches typically don't fare well in fan voting, so it's not surprising that Vea didn't receive any support. He's not be a household name for fans, but any scout assigned to the Pacific Northwest region should know him well.